I love a one pot, set & forget meal. Less washing up and less time spent prepping. I sound like Suzie Homemaker but it's true! Now that the weather is warming up, hearty stews on the slow cooker are a little less appealing (although, only a little...) so I've been seriously hitting up traybakes in the oven. And you know what? I think they're even easier than the slow cooker. Much less chopping and no need to brown any meat. Roast chicken pieces and baked sausages are high on rotation at our house right now. Below is an adaptation of a sausage and fennel recipe that my mother in-law snipped from Good Weekend magazine way back in 2008 (pictured above). Bonus points if you can find pork and fennel chipolatas. I'm also loving Baked ratatouille with snags, another Fairfax recipe from way back in 2008. It's a Jill Dupleix dish that I clipped from Epicure and then subsequently lost. Now whenever I want it I google "oven lovin' sausage". I really should write it down in case it's one day unavailable. Spanish chicken traybake with chorizo and peppers (pictured) from BBC Good Food. I allow an extra serve of chicken per person so we all have enough to eat without carbs. Chorizo chicken from BabyMac. You might like to whip up a salad or steam some greens to complete this meal but no need to cook spuds, they're already included. Mediterranean oven-baked chicken drumsticks from Annabel Karmel. Ok, there's no chorizo in this one but it's super easy and the kids love it, as you'd expect from AK. I often cook thigh cutlets for the adults as well as drumsticks. And in case you can't be bothered to follow the links above, here's the sausage and fennel recipe. Preheat the oven to 200 degrees. Cut the fennel vertically into wedges, keeping a little bit of the base on each to hold it together. 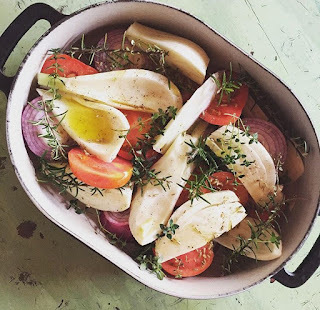 Arrange in a roasting pan with the onion and tomato. Scatter with thyme, rosemary and fennel seeds and drizzle over the olive oil Season well then tuck in the sausages, add the wine and bake uncovered for 45 minutes or until sausages are browned, tossing the veges and turning the sausages after 20 minutes.